In 2007, on an assignment by the New York Times Magazine to cover many of Shigeru Ban’s buildings, I was fortunate to travel extensively through Japan for almost two weeks. This allowed me to see other parts of the country besides Tokyo, as we visited the Paper Art Museum in Shizuoka, a private home called Maison E in Iwaki and the precious daycare center and Atsushi Imai Memorial Gymnasium in Odate, Akita. I met Shigeru Ban briefly on two occasions (and took one portrait) as Michael Kimmelman, the writer of the article for the New York Times, was doing parts of his research and interviews with Mr. Ban. Here is the link to the original article. Despite all work & glory, the memory that stuck with me the most, was our experience taking part in a traditional Japanese bathing ritual. Traveling with my trusted long time assistant Dan Levin as well as good friend and production designer Maki Takenouchi, who helped with the production and translations, we spent one night in Akita at a hotel that offered a hot spring. After a brief tutorial from Maki about what to expect and proper conduct, we got changed and entered the men only facility. As they say, what happens in Akita stays in Akita, but two hours later we certainly were the cleanest we had ever been, and the experience became another aspect of the Japanese culture that I absolutely love. There is a hilarious picture of us about to enter the spa, and I will add it to this post once I have managed to locate it. 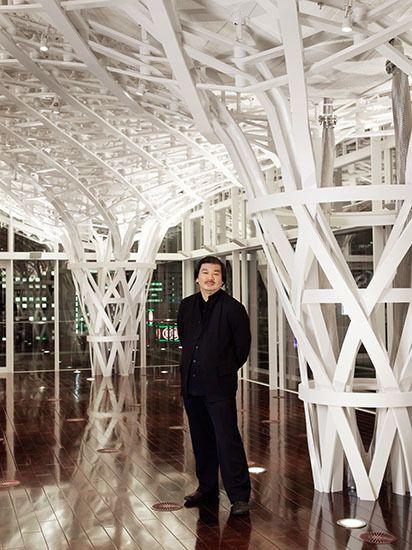 In the meantime: Congratulations, Shigeru Ban! 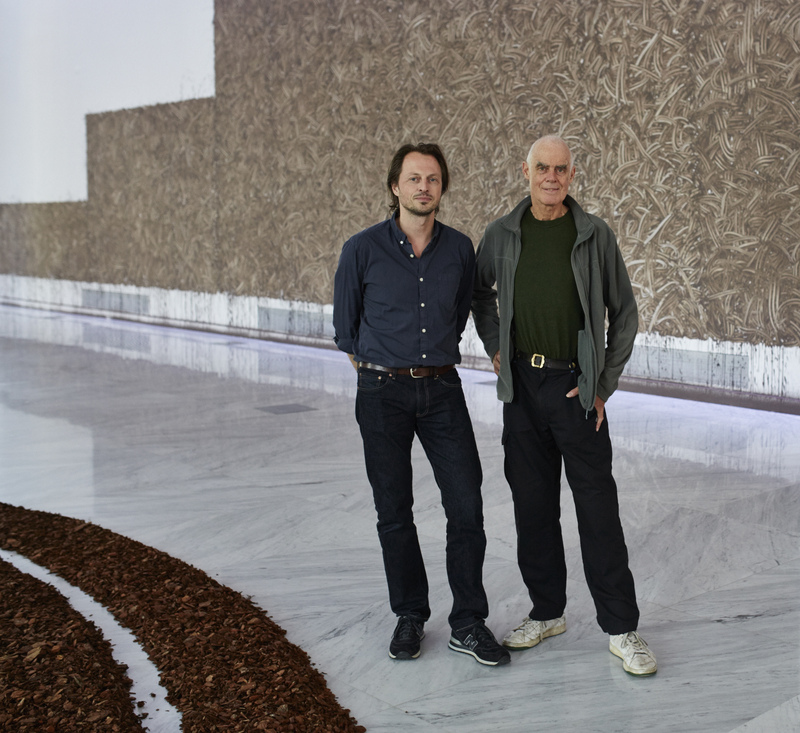 This was one of those remarkable photo shoots where I had the opportunity to spend two days with the architect himself. To say Tod Williams is “hands on” would be an understatement in this case. Within minutes upon his arrival Tod was rolling up his sleeves and moved, with the help of the owner, my assistant and myself even the heaviest pieces of furniture to optimize the compositions of the photographs. Some of the greatest, most accomplished people I have met in my career have been extraordinarily humble, accessible and unpretentious. Qualities I love in people and qualities that make working together exciting. That’s when that Aristotle quote about the “sum of its parts” kicks in: check your ego, collaborate, trust, be open, work hard, all of it with one goal in mind, which in my world means, creating great pictures. Nothing else matters, or let’s say, should matter in the context of a photo shoot. Tod ranks very very high on that list of people (“the great and unpretentious”). There were plenty of distractions and difficulties, but it was probably Tod’s focus and commitment to the shoot that in the end transcended all of it. I am thrilled to see the house finally published. It is beautiful! As I need to bridge an enormous gap between my last post and NOW, may as well start with what is most current: This morning, designboom (according to their own description “the first and largest independent publication dedicated to architecture and design”) ran a very image rich article on the only private residence ever built by Daniel Libeskind. Pretty much exactly two years ago, some fortunate circumstances led me to first meet one the owners in New York, then Daniel and his wife at the site and subsequently I was given the opportunity to photograph the house over the course of two days. Goal was to create a set of photographs for the owner’s records as well as for Studio Libeskind, and since then several of the images have appeared in some print magazines. Today’s article however showcases more images overall, including some that had not been published previously. I moved to New York in 1995 to assist fashion photographers. It didn’t take too long until I realized that fashion photography wasn’t my true calling, but still assisted in the fashion world while building my first portfolio of architectural and travel photography. The last person I assisted for before turning that corner to make my living exclusively from my own photography was Kelly Klein. She was at the beginning of her own career as a photographer and one of the nicest, most appreciative and generous “bosses” one can wish for in the high strung world of fashion photography. I recall her letting me photograph her apartment in the city to include it in my portfolio, as I was trying to start my own career. Throughout the years we stayed loosely in contact, some of my pictures are in her books on Pools, and most importantly I consider her a friend. Prior to Kelly, there was another photographer I assisted for, just as she started to switch careers from stylist to becoming a photographer, that became one of the great and inspirational encounters on my path in life and photography, Anita Calero. There is much that connects me to her personally, if not for her style, musical tastes and “aura” alone. Fast forward to 2005. My “big break” in editorial photography came in the form of my first assignment for the New York Times Magazine that marked the beginning of a relationship with the magazine and in particular with Pilar Viladas, the design editor, that has lasted until this day. That first assignment was a private house in Watermill, NY, designed by the architect firm 1100 Architect. I met Juergen Riehm during that shoot, one of the company’s two principals and 1100 has since become one of my clients. Fast forward to the day of my last post here, April 5th 2012. That very day, Architectural Digest called saying they had a great project for me to shoot in Palm Beach, without giving any further information. Later it turned out, the project was Kelly Klein’s new beach house, designed by 1100 Architect. The result can be seen in the August issue, with some excerpts online here. The opening page, the portrait of Kelly with her son Lukas, shows them sitting in her living room. Behind them, prominently on display, are two beautiful large scale photographs by Anita. So for me, as coincidence met with fate, this was a jewel of an assignment, where I got to photograph the home of someone I “love”, built by people I highly respect and with the added spirit and presence through her art of someone very special and dear to me. Full circles. Read Amy Kellner’s Blog post on my experience at the Just Born factory in Bethlehem, PA. The “proper” article on the production of Peeps is coming out this Sunday in the New York Times Magazine. By Nikolas | Posted in Editorial | Comments Off on When is a Peep not a Peep? I just finished a shoot for Architectural Digest in Aspen. I was working with Michael Reynolds, whom I have known “forever”, dating back to my days as a photo assistant. I have always known, that apart from being a great stylist/designer/editor, he can be hilariously funny, but this time around I actually learned that he has done some incredible things in his personal life. Coincidentally one of my all-time favorite photographers, Francois Halard, was shooting in Aspen at the same time, and we were able to enjoy a dinner together. In particularly odd seemed the fact that he had arrived in Aspen straight from his first trip to Dubai, where I will be going this Friday, also for the first time. On the day of our return to New York this past Sunday, we were surprised at the airport with the news that they were shutting down and cancelling all flights due to strong winds. Waiting that one out wasn’t an option for any of us, so we kept our rental car and went for a (beautiful) 4hr drive to the Denver airport instead. When it was all said and done, landing past midnight in Newark, getting a car to drive me to my car parked at Laguardia, I was finally in my own bed Monday morning at 3am. While I logged this as just one more “business as usual” experience, it did remind me of those funny charts about “What people think I do” or “How photographers actually spend their time“, as I can tell from channeling most people’s thought bubbles, that their firm belief is, those rings under my eyes must clearly be a result from too many “Après-ski cocktails” and heavy dancing in Aspen. I certainly have gained an entirely new view of fashion through experiencing these shows up close. I was taken by complete and welcomed surprise, that this assignment has become one the most exciting projects in past years. Seeing the vision, choreography, lighting, music and fashion come together for those few minutes reminded me of some of the inspiring performances I had seen of the Frankfurt Ballett by William Forsythe over twenty years ago when I was still living there. Standing on a rock in Central Park during rehearsals for the Moncler show, Gershwin playing and snow beginning to fall, it was like being part of the opening scenes of Woody Allen’s “Manhattan”: It was majestic, epic, awe-inspiring. For a few seconds, I “knew”, there was no place on earth that could possibly be more exciting than the spot I was capturing that very moment from with my camera. Marcelo was kind enough to let me post a few of the images on my site as a sneak-peak, until the story has been published in BIG. Here is an interesting write up by Pilar Viladas of the New York Times Magazine on Ian Schrager’s latest endeavor, the Public Hotel in Chicago. Her article is accompanied by some of my pictures I have taken for the hotel. I am now in my 12th year taking pictures of Ian Schrager’s projects, and I will always remember my very first shoot, which was the model room of the Hudson Hotel in NY. I have probably photographed several hundred hotel rooms by now, and can say that that particular shoot, my first big shoot for him, and as “luck” had it, of this tiny room with dark wood panelled walls, in the pre-digital era, when I was still shooting 4×5″ on chrome and everything had to be lit, exposed & filtered perfectly, was more stressful and felt technically more challenging than almost anything I have ever done since. For anyone interested in a visual of this little anecdote, I found this link on the web. The image on the left is a crop of my picture from 12 years ago. On Wednesday, I attended a lecture by Tom Kundig at the New York Public Library. He recently published his second book called Houses 2, featuring 17 residential projects, of which two I had photographed (Montecito, CA and Sitges, Spain) and some of those pictures had been included in the book. Admittedly, I have not attended many architecture lectures in my life but I thoroughly enjoyed seeing Tom in person and hear him talk about his background, memories and references that have informed his work. Surprisingly down to earth and accessible human being. What a cool guy! He even managed to get me interested in hot rods (had to be there…). By Nikolas | Posted in Hotel Photography | Comments Off on Works for me! Congratulations on earning 1,000,000 AAdvantage® miles! Photographed several stories for Architectural Digest in the past months. First one to be published in their October issue. Also photographed my first piece for W magazine. Shot Yotel in Manhattan for Softroom/Rockwell Group. Other noteworthy projects include a private townhouse at 40 Bond St, a private residence in the Nouvel building on the West Side highway, another building for Studios Architecture, and the first (and incredible) private Residence designed by Daniel Libeskind. Photographed a spectacular private residence by Tom Kundig in Sitges, Spain. Photographed for Hyatt their new Andaz brand in New York on 5th Avenue. Finally started to shoot Ian Schrager and Marriott’s new hotel brand “Edition”. Visited and photographed their first property in Waikiki over three shoots in 2010. The design company for this was Yabu Pushelberg. Went to Istanbul a couple weeks ago to photograph their second collaborative effort, this time with the help of Gabellini Shepherd architects. Images are still being retouched but should be up to the public eye very soon. Currently being completely occupied by a big project for Addison Group, an Annual report for one of their clients. Shooting for Rockwell Group at the end of the week. I left my agent Chris Boals Artists of nine (!) years at the end of last year, and am enjoying being in complete control again, and communicating directly with my clients. This year has started tremendously, and I am excited for what is to come.